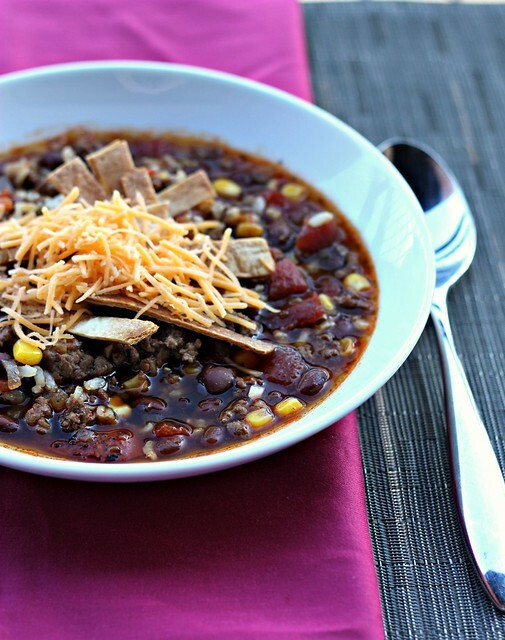 Crockpot Burrito Soup – Elly Says Opa! You want to know what a real holiday miracle is? Using the crockpot TWO times in a week. The slowcooker is one of those things I feel like you should have, and really love. The problem is, I really don’t. I mean, do not get me wrong. I love coming home to a hot, already-cooked meal. But my problem is we are gone for a relatively long time during the day and I feel like very few things stand up to that length of cooking without turning into a mushy mess or flavorless “plotz” (a term my dad coined to refer to food that makes that noise when it hits your plate). But, I have a great beef stew crockpot recipe that I use a decent amount in the wintertime, and it was so nice to come home to it the other week after a long, rainy day. 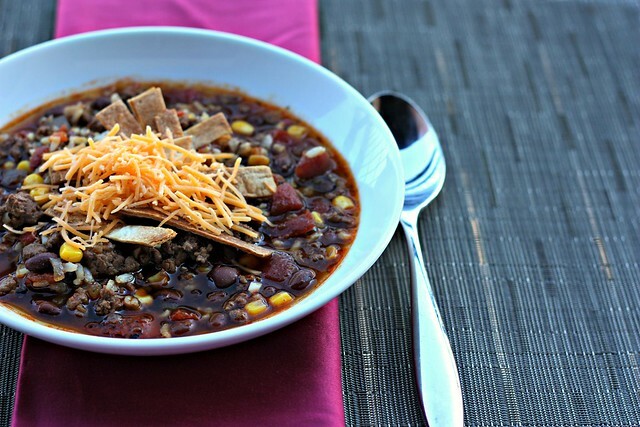 So, I decided to use the crockpot again the following week and see what I could come up with. I decided soups and chilis were safe options, so I mixed the two and came up with this burrito soup. I say burrito, not taco, because it has things like corn and black beans in it. The nice thing about this recipe is it’s very easy to put together (my beef stew recipe, while delicious, takes a bit of prep) and you can’t really overcook it. I did find, however, that the rice still turned a tad mushy even though I added it at the end so the next time I may just cook it separately, put it in bowls and then ladle the soup over the rice. This is a hearty, healthy, and great soup. You just need a salad and maybe a piece of cornbread and you’re good to go! Update: I’ve made this soup a few times and my preference is to make the rice separately and just add it to the soup at the end. I’ve also experimented with various chili powders and all are good in their own right—aleppo doesn’t add much heat at all, ancho adds just a bit, and my favorite is a hot chili powder, which definitely adds some kick. Use any type you want, or a mixture. Heat a large heavy-bottomed skillet over medium heat and add oil. Cook the onions for a couple minutes before adding the beef. Brown the beef with the onion and drain if necessary. Put back on the heat and stir in the garlic, just until fragrant. Pour the beef mixture into the crockpot and then add the tomato sauce, beef broth, spices, and black beans. Cook on low for…however long you’re gone. *Use 4 cups broth if cooking rice separately; use 4.5-5 if cooking rice in the crockpot.